This page lists new material that has recently been added to the web site. My deepest gratitude to readers and contributors! Although the original intention of this web site was simply to make the teachings of R' Pinchas and R' Raphael accessible to readers of English, the functionality of the site has now been expanded to serve readers of other languages as well. On each page, at the upper right corner, is a selection box for the Google Translate tool. If your primary language is not English, you can select another language, and the text will be translated automatically by a computer program. Although the translation may be inaccurate and incomplete, I hope it will nevertheless increase the usefulness of this site. Unfortunately, Google Translate does not yet offer translations into Hebrew or Yiddish, but I hope that these languages will be available sometime in the future. If you try this feature, I would be interested in receiving feedback about it (see Readers' Comments page for contact information). Bershader descendants: please see the recent additions to the Readers' Comments page, 5/22, 8/27, and 8/29/2008 and 7/8/2009, for some sources of genealogical information. I would love to hear from other descendants of families from Bershad or Tarashcha! Close-ups for comparison of inscriptions on original and new tombstones of R' Pinchas of Koretz at Shepetovka have been added. Two photos of the ohel of R' Raphael have been added. An exterior view shows the stone marker adjacent to the ohel, and an interior view shows kvittels and candle stubs left by visitors to the gravesite. I am happy to announce the acquisition of a large amount of new material about R' Raphael's life—particularly, his youth and old age—and about the unique nature of Bershad Chassidism. The sections on R' Raphael's moral character and his teachings have been expanded. There are also new details about his death and gravesite. The excerpts listed below were taken primarily from a memoir about some of R' Raphael's descendants (the Wortman family) and from three memorial books about the towns of Bershad, Ternovka, and Tarashcha, where R' Raphael and his family lived; Nathen Gabriel's skillful and polished translations from the Hebrew have, at last, made them accessible to English-speaking readers. I'd like to express my immense gratitude to Nathen for generously contributing his time and talent to this project. After R' Raphael died, the Bershad Chassidim tried to make Rabbi Ya'akov his successor, but he humbly refused. Rabbi Yaakov Wortman of Bosivka, who served as the rabbi of Ternovka, was not only the son-in-law of R' Raphael but also a distinguished disciple. Readers: please see the introductory note preceding these 8/2015 updates. The excepts below were taken from David Goldman's excellent translation of the chapter on R' Pinchas of Koretz by Eliezer Leoni in the Korets memorial (Yizkor) book, with the kind permission of Dr. Jeffrey Mark Paull, Project Coordinator. 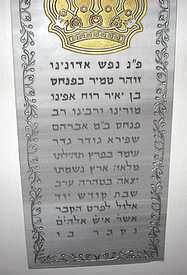 The memorial book is available on the JewishGen web site, at http://www.jewishgen.org/yizkor/Korets/Korets.html. Readers: please see the introductory note preceding these 12/2015 updates. A Genealogy section has been added to the Introduction. It includes a source providing details on the ancestry of R' Pinchas of Koretz, information on Y-DNA research studies on the genetic signatures of R' Pinchas and R' Raphael, and a link to the patrilineal family tree of R' Raphael of Bershad.